One of the questions we get asked is which leaf spring system is better for your trailer: Double Eye Springs or Slipper Springs. To understand which is better, you need to fully understand how both systems work. Let’s go into a comparison of the two on a tandem (2) axle configuration. The name says it all, “Double eye.” This refers to the construction of the spring. Each end of a double eye spring is rolled to create an eye or bolt hole. The spring is then bolted into the front and rear hangers (hangers are the system’s point of attachment to the trailer), and connected in the center by shackle straps and an equalizer. Once again, the name accurately describes how this suspension functions. Slipper springs have an eye on the front of the spring and an arched open end on the rear, allowing the spring to “slip” on the equalizer or rear hanger. 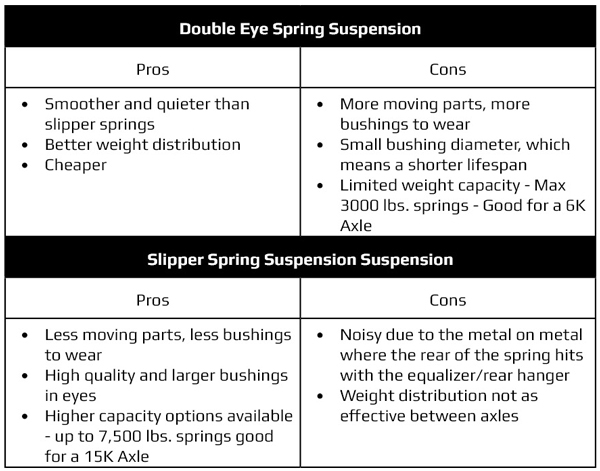 When it comes to purchasing or repairing your trailer, selecting the correct spring suspension for your application can be a tough decision, as many variables come into play. For example, most light RV’s come standard with double eye suspension because it’s a quieter system with minimal steel on steel locations, it’s the most cost-effective of the two systems, and typically RV’s don’t get used as often as – compared to commercial trailers – so componentry lifespan (particularly the bushings) isn’t as big of a consideration. On the other hand, most commercial equipment trailers (think flat decks and dump trailers) have slipper springs because they require a larger amount of weight capacity and longer wear life in the bushings to withstand more regular use. Over the years of running a repair shop, we’ve seen many trailers come through our doors that require a different suspension set up than what is currently on the trailer. The most common replacement we make is from a double eye to a slipper, rather than a slipper to a double eye. Why? Well, ultimately, RV’s and 5th wheels keep getting bigger and heavier, with many manufacturers deciding not to upgrade the capacity of their springs and axles as the size and weight increases. We find that on these larger units, the double eye suspension isn’t able to keep up with the increased weight, which causes stress on components like bushings, springs, hangers, and shackle straps. When this is the case, the best solution is to remove all the hangers and double eye springs and install new hangers with heavier capacity slipper springs. If you’re finding that capacity is not your problem, but the wear life of your bushings is, we have solutions for extending the service life of your suspension like using different bushing materials, greasable bolts, rubber equalizers, and thicker shackle straps. We hope that this short tutorial has helped broaden your understanding of the double eye and slipper spring suspensions. If you have any questions or comments, please don’t hesitate to give us a call!